Rusty Brinkman offers a variety of heirloom veggies at the Tuesday Farmers Market in Cheyenne, Wyoming. Photo by Barb Gorges. At the Laramie County Fair back in August, I was checking out the blue-ribbon vegetable winners and one name kept popping up over and over: Rusty Brinkman. I met Brinkman and his partner Vally Gollogly last summer at a lunch they catered at their home just outside Cheyenne—a garden-to-table treat. Midsummer, Brinkman partially rolls back the cover of his hoop house. Chickens are on patrol, looking for insects. Photo by Barb Gorges. This spring, Brinkman added a high tunnel and a half-dozen chickens. 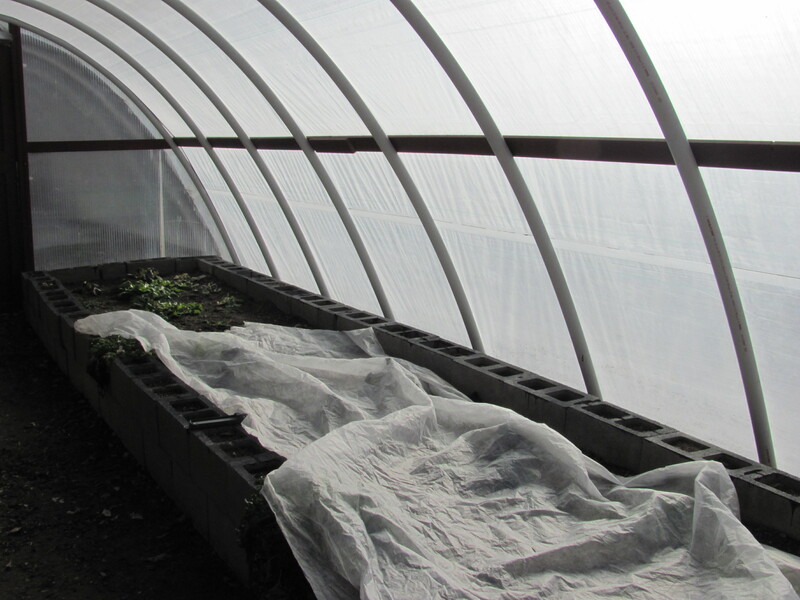 The greenhouse-like high tunnel will let him to grow vegetables that need a longer growing season than Cheyenne allows. The chickens keep the insect pest numbers down, but at the cost of a little pecking damage. They seem to like yellow vegetables so Brinkman has to throw a little vegetation over the yellow squashes to protect them. 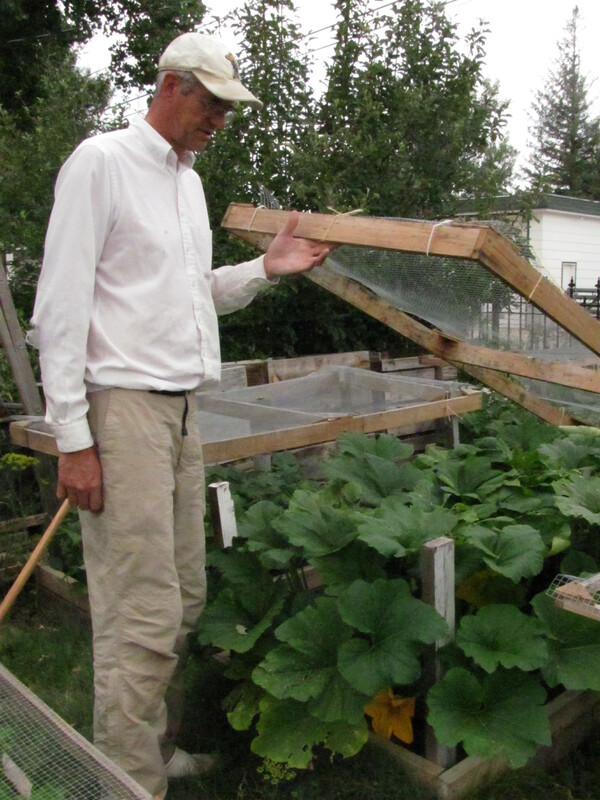 His backyard garden is sizeable, but he also helps garden another 4,000 square feet over at his uncle’s, where he has a real greenhouse to get seedlings started in spring. A couple years ago when he and Gollogly had an abundance of dill, they thought it would be fun to offer the excess at the Tuesday Farmers Market. Now they are regulars, under the Mooo’s Market banner. Gollogly specializes in prepping the flowers and herbs, Brinkman the veggies. Their booth has a certain flair, a certain presentation. That might be because Brinkman’s day job is owner of Crow Creek Catering. As a chef, the Cheyenne native has plied his trade in Denver, New York and the Wyoming [correction: Colorado] governor’s mansion. He knows presentation is an important part of the dining experience. So what does a chef grow in his garden? Brinkman is a proponent of organic methods so I’m not surprised he also gravitates to the heirlooms. Heirloom vegetables are open-pollinated. This means if you save the seeds, you can grow the same vegetables again next year. If you save the seeds from the best individual fruits and vegetables, you might end up with improved strains the next year. Over time, you will have varieties ideally suited to Cheyenne. On the other hand, hybrid fruits and vegetables also produce seed, but plants grown from those seeds won’t grow true to the parent plant. Brinkman is experimenting with seed saving, but otherwise his chief source is Baker Creek Heirloom Seeds, www.rareseeds. I have the 2015 catalog: 350 pages of delicious photos of vegetables and fruit from all over the world with exotic names and long descriptions. For a gardener, it’s like being in a candy shop. But it is important to keep in mind our local climate and look for short-season veggies. Now that he is selling at the market, Brinkman also looks for varieties not sold at the grocery store. There is so much to choose from. Offerings include purple tomatoes, oddly-shaped squash, a multitude of greens, pointy cabbage, red carrots. But in the end, they need to produce in Cheyenne and they have to pass the taste test–appealing to a gardener who cooks. Brinkman shared with me a nine-page, single-spaced printout of his garden records for the past three years, organized by vegetable type, variety, heirloom status, year trialed, seed company, how many days to maturity, description. There are 360 entries to date, but some vegetables did not make the cut and were not planted a second year. This scientific analysis is similar to Brinkman and Gollogly’s training in the science of food preparation. Cooking is one part art and a large part science. You need to understand how ingredients interact with each other. If you invent a good dish, you need to be able to reproduce it, just like scientific studies need to be replicable. Vegetable gardening is also science, trying to produce the best crop each year. Brinkman prepares new beds by smothering grass with cardboard or metal plates (he makes folk art from junk metal), then he rototills it. Once a bed is established though, he only uses a garden fork to loosen things in the spring and add compost. 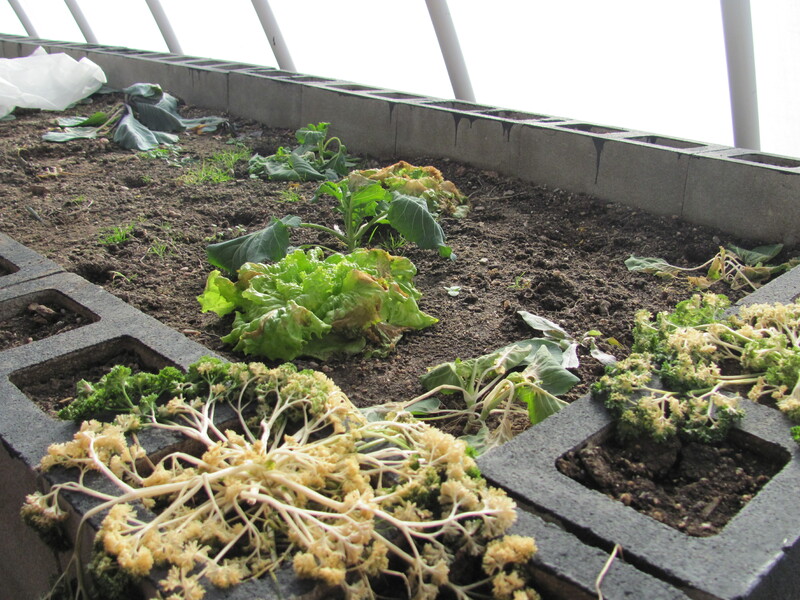 His compost system is nearly keeping up with the garden’s needs and he fills in with more from the city compost facility. But Brinkman also uses Espoma’s Plant-tone to add microbes and nutrients, and in the fall, he adds old cow manure. Brinkman hand-pulls weeds. Photo by Barb Gorges. 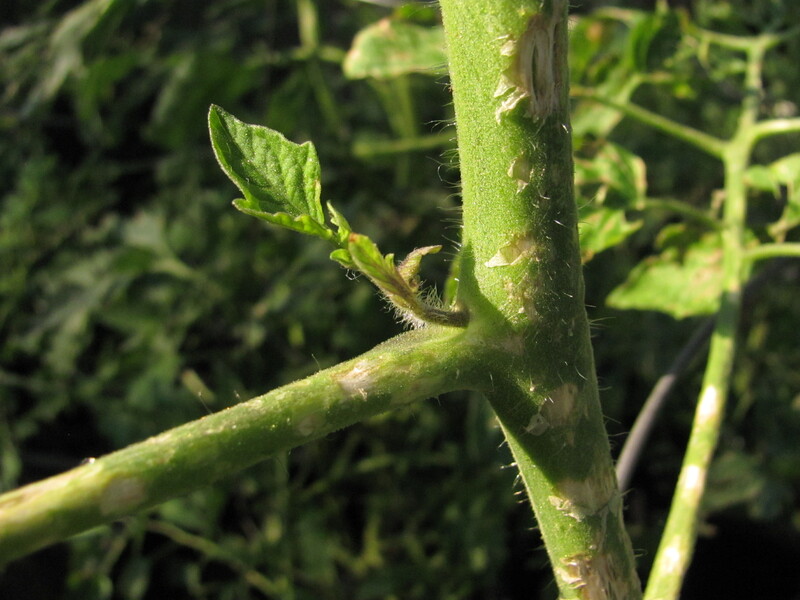 –Neem oil has worked very well for aphids. –Releasing ladybugs and lacewings in the spring, also for aphid control, seems to be working. –Using Bt (a friendly bacterium) for cabbage whites (butterflies) for the first time this year seems to help. 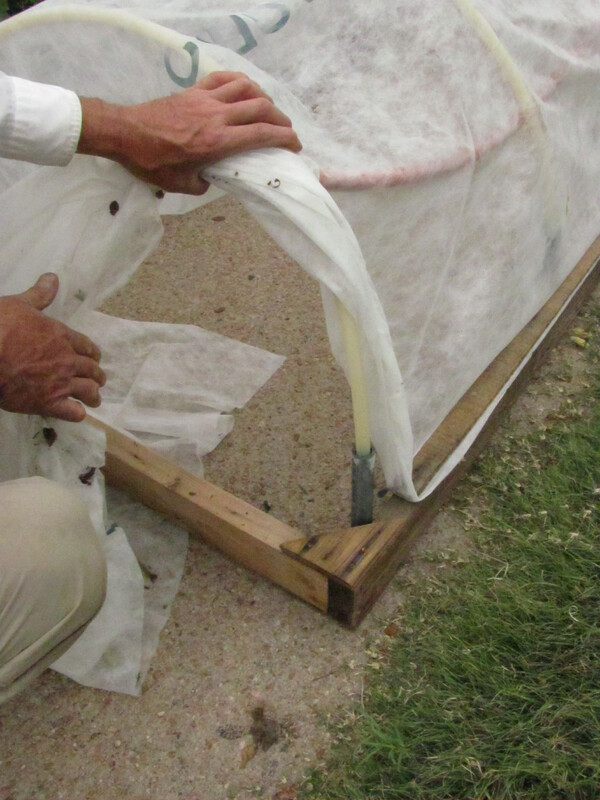 –Agribon, a light-weight, white polypropylene fabric spread over the carrots seems to be controlling the carrot rust fly. 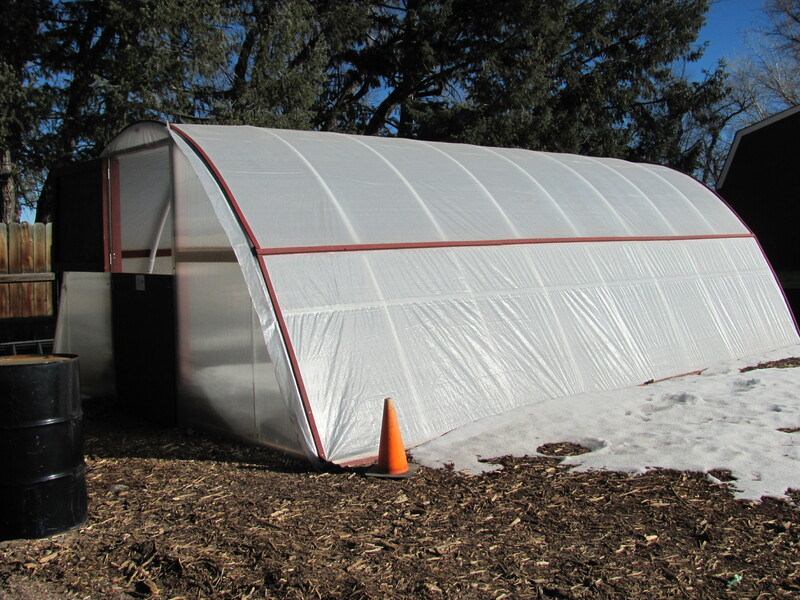 To get an early start on the season, in late March or early April, Brinkman uses low tunnels, stretching plastic sheeting over hoops placed over his beds. Much of the garden area is irrigated using drip tape (flattened plastic hose that has a series of small holes). So what was planted in the Brinkman/Gollogly garden this year? Lots of varieties with delicious-sounding names. Brinkman will know soon which ones have performed well enough to make the cut next year. Here’s a sampling you might find at their booth at the farmers market next Tuesday. 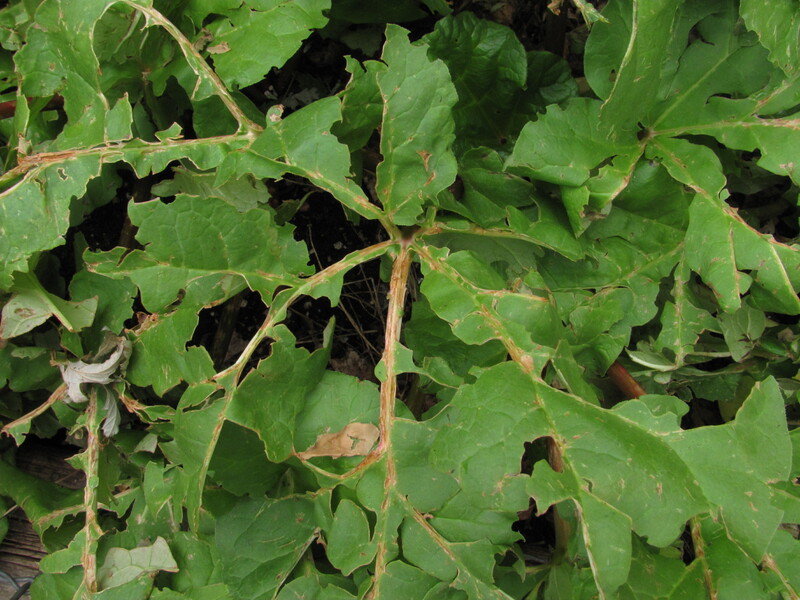 If customers aren’t quite ready for “Tronchuda”, a Portuguese variety of kale, no matter. Brinkman can take it home and turn into dinner, or prep it for the freezer. Beans: Mayflower, Greasy Grits, Dixie Speckled Butterpea, Golden Sunshine, California Blackeye Pea. Heirloom beets come in a variety of colors and shapes. Photo by Barb Gorges. Broccoli: Purple Peacock, Romanesco Italia, Umpqua. Cabbage: Aubervilliers, Bacalan de Rennes, Couer de Boeuf des Vertus, Cour di Bue. Celery: Giant Prague, Tendercrisp, Utah Tall. Peppers (sweet): Antohi Romanian, Topepo Rosso. Peppers (hot): NuMex Joe E. Parker. Eggplant: Syrian Stuffing, Turkish Orange. Kale: Dwarf Siberian, Nash’s Green, Nero di Toscana. Lettuce: Crisp Mint, Little Gem, Baby Oakleaf. Heirloom onions. Photo by Barb Gorges. Onion: Flat of Italy, Red of Florence. Tomato: Cherokee Purple, Large Barred Boar, Cream Sausage, Transparent, Glacier, Topaz, Woodle Orange. Turnip: Boule D’or, Golden Globe, Mikado, Purple Top White Globe. Categories: Gardening, Heirloom vegetables, Hoop houses, Seeds, Uncategorized, Vegetables | Tags: Baker Creek Heirloom Seeds, Cheyenne, garden, garden records, gardening, Heirloom vegetables, hoop houses, Laramie County Fair, Rusty Brinkman, Tuesday Farmers Market, Valli Gollogly, Vally Gollogly, vegetable gardening, Wyoming | Permalink.